Woody Allen has finally come to Tuscaloosa! By that I mean a movie of his. I have been a fan of Allen’s work for about three years now and I can honestly say I have seen almost all of his films. You see where I am from there is not that much demand for Allen films, so Midnight in Paris was the first Woody Allen film I was able to see on the big screen. Good thing too because I could not have picked a better choice. By the opening scene I was not in Alabama anymore, but I was in Paris, France. Yes, I know that is hard to comprehend, but if you saw the film the way I saw it you would agree. I was also surprised when I walked into the theatre because it was actually crowded. I was wondering if I was in the right theatre because I really did not expect that many people in my town to go see a Woody Allen at 2:45 p.m. on a Saturday. One of the main reasons why I think there was a good turnout was because of the star of the film, Owen Wilson. I think a few people in there were expecting Wedding Crashers 2, but they got a Woody Allen film filled with references of famous people from the 1920s, like Ernest Hemingway, F. Scott Fitzgerald, and Cole Porter. However, that does not mean they left unsatisfied. I am going to try my best to not spoil Allen’s clever story, but I cannot promise that. Midnight in Paris is about a successful Hollywood screenwriter Gil Pender (Owen Wilson), who is unhappy about his life as just a Hollywood “hack.” Gil wants to write novels, and more importantly, he wants to write novels in Paris. Gil is infatuated with the city of Paris. His fiancée Inez (Rachel McAdams), however, is not so in love with the city of Paris, or the idea of Gil writing books instead of movies. Inez wants to live in Malibu, California once they are married. She wants to follow in the footsteps of her parents (Kurt Fuller and Mimi Kennedy). Also, her parents are actually not too thrilled about Inez marrying Gil. They see him as an unreliable and irresponsible husband. 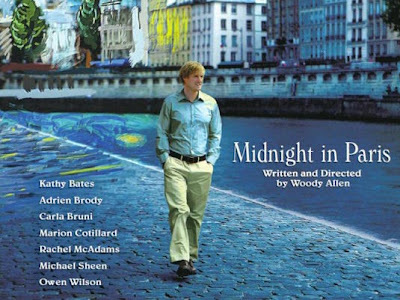 One night after a wine tasting with Inez, her parents, and Paul and Carol Bates (Michael Sheen and Carol Bates), Gil decides to walk around Paris alone. I guess you can say he was a little drunk from the wine tasting when he realized he was lost in Paris. While sitting down on a church’s steps, hoping someone who knows English passes by, a car pulls up and stops. It is full of some friendly strangers who offer to take Gil to a party. Once Gil arrives at the party, he realizes that he has been transported to a different time, 1920s Paris to be exact. Ah dang it! I told you the twist. Trust me you can still see the movie, even though you know that. Actually, it might help you understand it more. Well, while at this party Gil meets some of his idols, like Zelda and F. Scott Fitzgerald (Alison Pill and Tom Hiddleston). They in turn introduce him to Ernest Hemingway (Corey Stoll). Gil is in awe by Hemingway and the Fitzgeralds. Everything he had heard about them or read books turned out to be true. During more of his midnight outings, Gil meets other famous artists like Salvador Dali, Pablo Picasso, T.S. Eliot, Man Ray, and Gertrude Stein (Kathy Bates). And probably the most important person that Gil meets is Adriana (Marion Cotillard). Adriana has begins to have feelings for Gil. The problem is though that Gil still has his present life to worry about with his fiancée, her parents, and the “pseudo-intellectual” Paul Bates. Looking back on this review I realize I have not revealed too much about the movie. I honestly do not think any of this information spoils it for you. I just think it might help you understand the movie better. I will go on the record right now and say Midnight in Paris will be nominated for some Academy Awards this year. I think Woody Allen’s screenplay should be a lock for a Best Original Screenplay and will probably win. I also think that Midnight in Paris might gain a nomination for one of its actors or actresses. Right now my bet is on Marion Cotillard, but I might be wrong. I think the main reason why Allen’s 41st film is doing so well (Yes, I did say 41st) is because of the presence, and performance, of Owen Wilson. I think it is one of Wilson’s best performances to date. He is funny, sincere, and turns the “Woody Allen” character into his own. I think that is what makes the film so original and not just a bad remake of an early Allen film. Lately, I have come to notice in most of Allen’s films there is that one guy who is trying to play Woody Allen. I think Wilson has done the best job at it because he does not play it as Allen’s alter ego. Also, Kathy Bates’ Gertrude Stein is not a main character in the film, but in my opinion she steals every scene she is in. She might be a dark horse nomination at the Academy Awards this year for Best Supporting Actress. But I have a feeling that is a long shot. Another favorite character of mine is Cotillard’s Adrianna. From the very first frame Cotillard was on screen I could not help, but fall in love with this character. I remember reading an interview of Woody Allen once and he talked about how much thought he puts into introducing the lead female character. He tries to find that perfect shot, that perfect introduction of the character. He did it in Match Point with Scarlett Johansson and in Annie Hall with Diane Keaton. I think the introduction of Cotillard’s character is my favorite. Allen could not have done it any better. When I was in the theatre, I was honestly afraid at the beginning that people would walk out. The reason for that was because for the first few minutes Allen just showed shots of Paris. Paris in the morning, Paris in the afternoon, Paris in the rain, and Paris at night. I could just hear the people thinking, “What is going on?” However, by the end of the film the audience had fallen in love. They were trying to guess what would happen next and they would gasp when they were wrong. Yes, they did that. I always like hearing people talk about the movie when they walk out of the theatre. When I walked out Midnight in Paris, I saw these two older women walking ahead of me and they were both silent for a while. Once we walked out of the theatre one said to the other, “That was a clever story. It was good. It was really, really good.” I would completely agree. MY SUGGESTION: If you are a fan of Owen Wilson, then go see it. You might not the get the references that are in the film, but it does not take away from the film. I honestly think that this film might introduce Woody Allen to a new generation of moviegoers. This is one of his best films in years and one of my favorites by him.